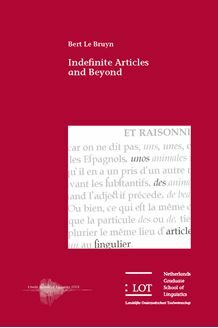 This dissertation challenges the standard view on indefinite articles as argu­ment markers and determiners that block bare nominal arguments. It argues for a more fine-grained view in which articles are poor in their semantics but rich in their pragmatic competition with bare nominals and other determiners. On the basis of new data, both from synchrony and diachrony, historical simu­lations and detailed analyses within formal semantics and pragmatics (espe­cially Optimality Theory) it shows how the merits of functionalism can be ex­ploited without giving up the formal precision of the generative approach to linguistics. On the empirical side, it presents new analyses of Spanish unos, French des, bare partitives and the use of Dutch een and English a in predicate position. This dissertation will be of interest to all those working on the semantics, prag­matics and/or syntax of DPs, language evolution and/or the interaction be­tween semantics and pragmatics.